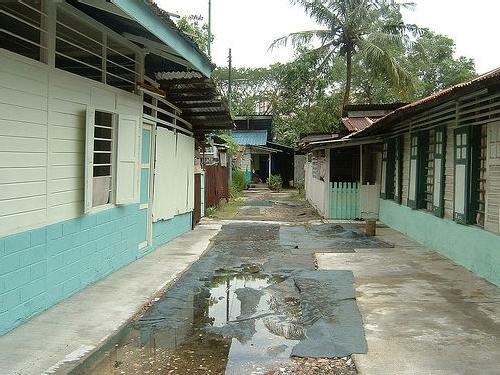 'I was in Jalan Kayu recently (early March 2005) when I decided to visit Kampong Lorong Buangkok, the last kampong on mainland Singapore. I had heard that this kampong is also known as "Selak Kain" (to pull up one's sarong/skirt) due to it being prone to flooding. There are still a few households there, mainly Chinese and Malay villagers leading simple lifestyle. Among the surrounding greenery, there's a very interesting trek through some forest and remnants of kampong gardens leading to a wide canal which looked like a mini "yellow river of China." Egrets and herons were spotted near the banks. The village is prone to flooding and a year ago, apparently between 8th - 10th March 2004, several households were affected, although it was not the worst they had experienced. A few articles appeared in The New Paper at the time. "We told you so." By Kor Kian Beng. The New Paper, ?8 Mar 2004. Google cache - [pdf]. PUB had sent out warning that residents of some low-lying areas could face flooding on Mar 8, 9 and 10. "Kampung weekend." By Sim Chi Yin. The New Paper, 23 Mar 2004. Google cache - [pdf]. It's most quiet at Kampung Lorong Buangkok. The elderly stop for a leisurely chat, cats laze in the shade, even the kampung's sole business establishment is dozing in the heat. But come the weekend, and grandchildren and children aplenty descend on the kampung for visits and to escape the city. From their happy smiles, it's obviously a visit they relish. "Kampung calm." By Sim Chi Yin. The New Paper, 23 Mar 2004. Google cache - [pdf]. One of S'pore's last kampungs made the news recently when the rain brought floods. So what's life in this village in Hougang like? There appears to be two sessions at least during which Ngee Ann Polytechnic teamed up with villagers for community service (source: Ngee Ann Polytechnic Events & Annnouncements - link). 2 Oct 2004 - Eight students from Ngee Ann Polytechnic's School of Engineering rolled up their sleeves and battled pesky mosquitoes at Kampung Lorong Buangkok for a good cause. Their mission? To help the residents repair their mosque in time for the coming fasting month. The students joined forces with the Jalan Kayu Citizens' Consultative Committee to change the roof, repaint the building and raise the concrete floor to prevent flood water from rushing in during heavy rain. The wide canal Jess likened to a "little yellow river", is in fact the village's connection to the sea - it is the upper reaches of the Sungei Punggol, which eventually drains into the Eastern Straits of Johor. For a perspective, see this StreetDirectory.com map of the location of the kampung and this map which shows where the Sungei Punggol drains out to the sea. The red star denotes the kampung's location. The Sungei Punggol drains under the Tampines Expressway (TPE), and it is the mangove estuary we see from the Punggol Bridge at the 11km point of the TPE. I was fascinated enough by the area to include this in the SSC Guide to the Mangroves of Singapore [link], and got a friend, Goh Wee Kee (a botany student I called Connaraceae) to drive me down for a photo from the highway! - link. My father described the place as a mangrove creek and so did D. H. Murphy, and the odd taxi driver. They talked about a wooden bridge that extended across the estuary which gave the place its name - "Woodbridge," eventually made famous by the "mental hospital" which was apparently named Woodbridge Hospital in 1951. This hospital shifted to Hougang in 1993 and in a rare move, the name Jalan Woodbridge was changed to Gerald Drive throughout its extent, reportedly due to a perceived negative association with the name - but mental health professionals would probably not feel the same way. Remnants of that road name can be detected on maps on the internet at Street Directory.com and Asiamaya.com. Though I visted the area as a child in the late 70's, I cannot recall a mangrove creek, only the canal and the Shell station. See Chan Sow Yan's photos on Exploration Trails. Sasi Nayar who worked in the area between 2002-2004 studied the nutrient and environmental contaminant pathways in Sungei Punggol, and his conclusions, handily summarised as diagrams are instructive. The river was battered with mangrove deforestation (the bansk were later beautified with grass! ), historical contaminents were dredged up, driving bactierial counts off the scale, land development fed the river for years (was present in 1999), as did dredge spil lying on the river banks during the monsoon! The area was also fed with water from the Eastern Straits of Johor, which drain the rivers of south-eastern Johor. The Sungei Punggol will not be a river much longer - in October 2004, a PUB spokesman finally revealed that "...Sungei Punggol and Sungei Serangoon are expected to be converted to reservoirs by 2009." - link.